In a room where the existing furnace system is not sufficient to heat the room, or in a remodeled space where adding ductwork is not practical, the logical answer may be to add electric baseboard heating. For example, a remodeled basement or attic, or an attached garage converted to a living space may benefit from installing either 120-volt or 240-volt electric baseboard heating units. It is a stand-alone solution that requires no additional ductwork or piping. But if none of these solutions help, it's time to look into electric baseboard heaters. Electric baseboard heating units come in many styles. Portable versions plug into standard 120-volt outlets and can be a good choice for rooms that will be used only sporadically. For ongoing use, though, you will likely want permanent (hard-wired) baseboard heaters that are wired directly into a household circuit. They are available in both 120-volt and 240-volt models (though 240 is more common and more energy efficient) and in a variety of lengths, from 24 inches to 96 inches. 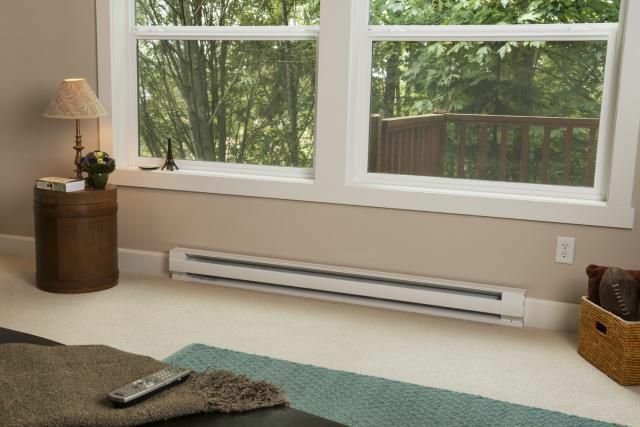 Most electric baseboard heaters work electrical resistance—the heating element warms up as a natural reaction to electricity passing through it. There are also hydronic types, which work by heating up a self-contained reservoir filled with fluid. The fluid heats of metal fins, which radiate heat outward into the room. The heat output of all-electric baseboard heaters is specified by its wattage, which governs the amount of energy it consumes as well as its heat energy output. Watts are a unit for measuring electricity, and for any given baseboard, the output wattage will be governed by the size (length) of the heating unit and by the voltage of the unit. At the same length, a 240-volt baseboard heater produces (and consumes) twice the wattage of a 120-volt heater. As a rule of thumb, assume a room requires 10 watts of electric heating per square foot of room. In other words, a 10 x 10 room (100 square feet) will require 1000 watts of electric baseboard heating. This heating can be provided by a single baseboard heater mounted on a single wall, or, for larger rooms, the total wattage can be provided by two or more heaters. Measure the length and width of the room, in feet. Multiply the length x the width to get the square footage. Multiply the square footage x 10, to give you the rough wattage of heating required for the room. Choose one or more baseboard heaters that total or exceed the required wattage calculation. The wattage information is specified on the heater packaging and labeling. Typically, a 1500 watt / 240 volt unit can heat a 150 to 175 square-foot room. Make adjustments to the heater size under some circumstances. For example, a room with two outside walls that are poorly insulated, or that include many windows, may require more baseboard heating. Similarly, a tall room with unheated space above it may require more heating. On the other hand, a small room with only interior walls may get by with a smaller baseboard heater. With your heater properly sized, you are ready to install it.